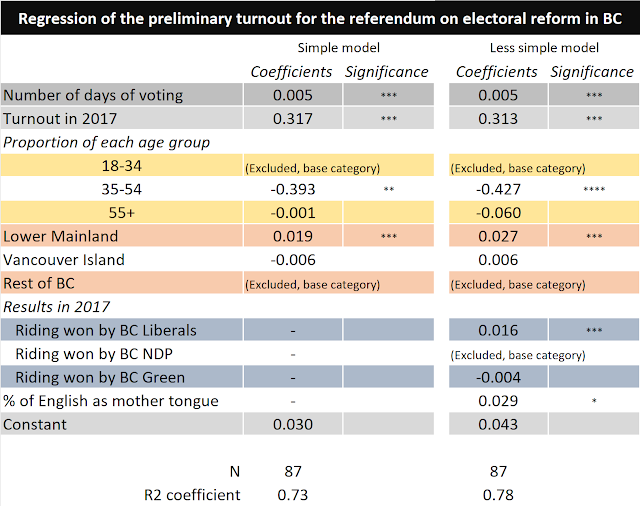 Interesting new turnout data published by Elections BC yesterday. Let's take a look. 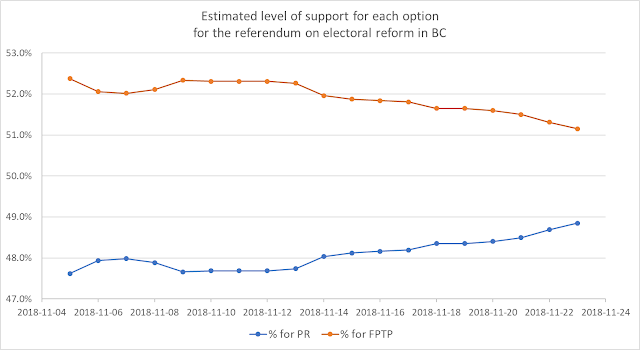 Using all the information available so far (polls, turnout by riding, data about the turnout by age in 2017), here is my best estimate of the current situation in the referendum on electoral reform in BC. The NO side (keeping FPTP) is still ahead but the trend is favourable to the YES side (switching to proportional representation). The gap was 4.8% at the beginning and is now only 2.3%. Over the last few days alone, the YES side has progressed by an estimated 1 point. How do I estimate these votes? Knowing the number of votes from each riding and knowing the age profile and regional location of these ridings, I estimate how any of these votes are likely a YES or a NO. Without going into the details, a riding in the interior with a high share of voters over 55 is likely to vote in majority to keep the current system. The exact calculations involved the polling averages and the turnout by age of 2017. If you are among the dozen of people who actually read my blog on this topic, you should remember that my previous post was saying the YES might have been ahead already. So what happened? Well I was using the census data to get an age distribution by riding. But Elections BC has something better: the turnout by age by riding in 2017 (and before). This is a more accurate measure of who is potentially voting, but this is also a measure that hurts the PR side because older voters represent a disproportionate share of the voters (see below). So it isn't that I changed my mind or trying to generate clicks on my site, it really is just an updated version of what I was doing. The good news is, I believe, that my model will now remain the same. If I were to use the census age profile of my last post, then PR would be ahead 50.6% to 49.4%. Based on the data published by Elections BC on Friday, the turnout is already 30%, although it falls to 18.9% if we only count the ballots that have already been processed. The roughly 12-points gap seems to be fairly consistent (i.e: both measures increase at a similar rate). 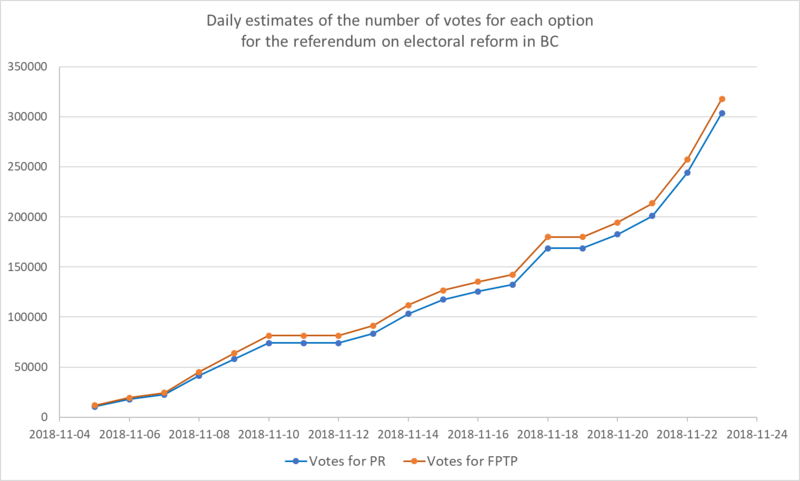 Extrapolating the trend for processed ballots until the 30th and assuming the gap remains the same, it seems the turnout could end up close (or even above) the 40% mark (which, incidentally, is the arbitrary threshold set by the BC Liberal leader Andrew Wilkinson to recognize this referendum as "legitimate"). This is higher than I was predicting at first. One reason is because my early predictions were based on the turnout among processed ballots (Elections BC only mentioned they had way more ballots than the ones processed relatively recently). It's actually not impossible that we end up with a higher turnout than for the HST referendum! Using Google Search as a measure of the interest for this referendum, we can see a declining search activity since the peaked around the debate (November 7th). 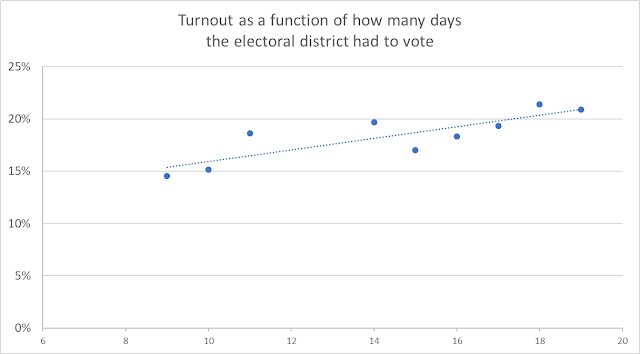 So I'm not sure we should expect a late surge in turnout, but we never know. This whole analysis is also made more complicated because of the possible impact of the rotating strikes of Canada Post. Overall though, the turnout will go from decent (low 30s) to quite good (40% and more). For a referendum coming in November, after a municipal election and regarding a topic that isn't the most interesting for many people, I consider this a small victory. Fears of ridiculously low turnout that would make this referendum invalid can be set aside it seems. The current turnout is still heavily influenced by when the riding was scheduled to received the ballots, although the November 2nd group is clearly catching up to the 23 ridings that got their ballots early. As explained in a previous post, the scheduled date from Elections BC isn't perfect and we know for a fact that ridings on the same schedule didn't received their ballots at the same time. 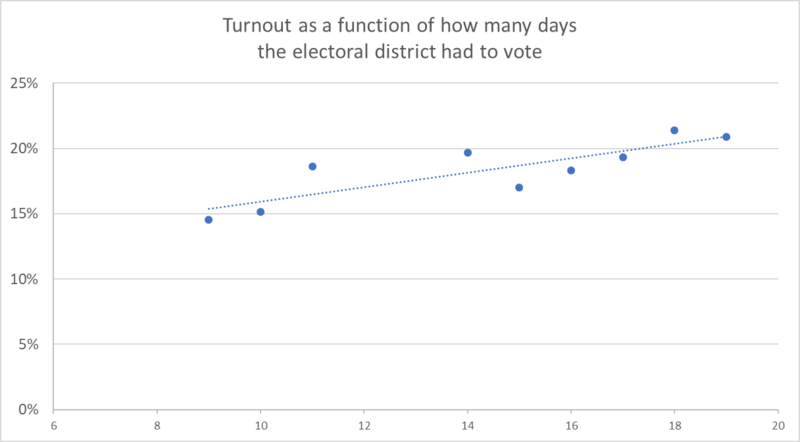 This is why I prefer using my measure of "days where the turnout has been over 1%" as my measure of how many true days each riding has had to vote. There is still a strong relationship but it's converging for sure. There shouldn't be any relationship by the end of this process (if there is, then this could be problematic as it'd mean the ridings that got lucky and received their ballots earlier voted more). As comparisons, during the 2017 BC elections, these rates were, respectively, 59.7%, 66.4% and 60.2%. Also, and maybe more importantly for this referendum, the last few days have seen a dramatic increase in the Lower Mainland. It seems the many ridings that got their ballots later started voting (or Elections BC started counting them). Just 3 days ago the turnouts were, again respectively, 8.8%, 14% and 15%. The regions that are known to be more pro PR (Lower Mainland and the Island -where the BC Green are the strongest) have caught up with the interior (and actually surpassed it for the Island). This trend is the big reason for the trend in favour of the YES side in the graph above. If it were to continue until Elections BC is done receiving and counting the ballots, I think the chances of a victory for the YES would become quite good. The region isn't the only important factor. Polls have all shown that age is a crucial determinant of the level of support for proportional representation. In average, the 18-34 represented only 18% of the voters while the 55+ accounted for 49.8% of the ballots cast. So there is no question that the fact FPTP is the most popular option among the 55+ crowd is making switching to proportional representation difficult. Turnout in 2013 were also fairly similar. We obviously don't know who is voting in each riding, we just know the total number of votes so far. Still, we can try to see some patterns. But for this, we need a regression. If you don't know anything about statistics, see a regression as correlations measured while holding other factors constant. So since ridings in the interior also have more older voters, it's hard to disentangle which variable is affecting what. A regression solves this problem. The significance level is simply a statistical measure of how confident we are of the results. If there is no * next to the coefficients, it means it isn't significant and we consider that there isn't a relationship between the turnout and this variable. The more stars, the more confident we are (* for 10% uncertainty, ** for 5% and *** for less than 1%). What I want to know now is if, after controlling for the number of days each riding had to vote and the region, the current turnout is still higher in ridings with more voters aged 55 and over. As mentioned above, I'm now using the actual turnout by age to determine the age composition of each riding. Thus instead of using the proportions of people aged 18 to 34, I'm using the share of voters that were 18-34 in 2017. I'm including the turnout in 2017 as a control. I really want to measure differences between this referendum and the previous election. Why? Because if we were to observe a significant different (for instance 55+ voting much more), then my vote estimates of above would likely be incorrect. What we see is that ridings with a bigger share of 55+ are NOT voting more anymore. At least if compared with the 18-34 group (this is really how you should interpret the coefficients). It seems this referendum is motivating two groups to vote: young people (who want PR) and older folks (who want to keep the current system). The 35-54 (who are the most 50-50 on PR based on polls) seem less interested. Just a technical note here: I'm using aggregate data (at the riding level) and therefore my regressions are subject to the typical ecological fallacy. What is this? Let's use an example. In the US, traditionally, richer people vote Republican (that might have changed with Trump but let's ignore him). At the same time rich states (NY, California) vote Democrat. So the correlation at the aggregate level doesn't match with the one at the individual one. In BC, we observe a similar effect where ridings that vote NDP have a higher proportion of Asian people but polls have shown that Asian people are more likely to vote for the BC Liberals. What does it mean for the current regression? Well hard to tell, but you should at least keep in mind that I'm not actually observing the age of the current voters, only that ridings with more older and younger voters are voting more. 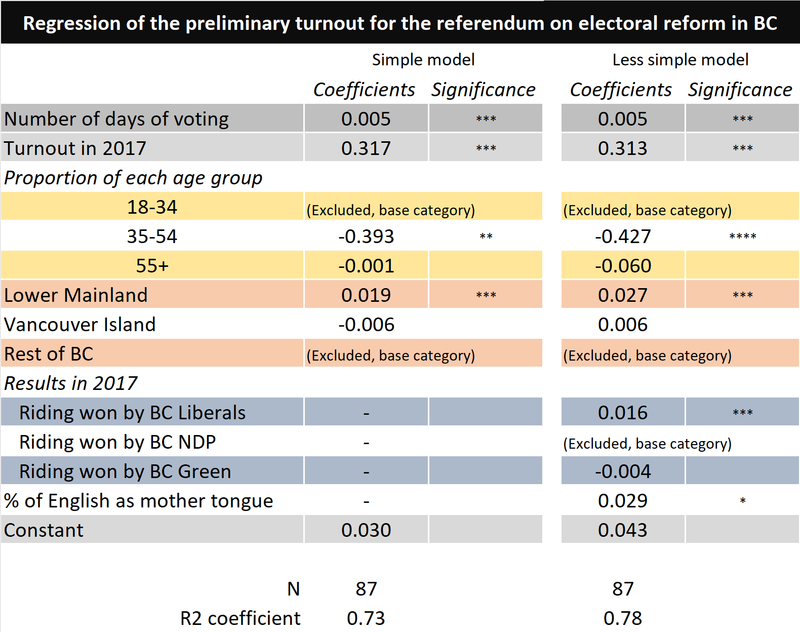 For instance, imagine a scenario where this referendum is motivating young people in ridings with a higher share of older voters, then the higher turnout from those ridings would actually be favourable to PR as opposed to my assumptions. The results here are quite different from the ones a few days ago. If I used the turnout of just 3 days ago for instance, I'd find that the 55+ were voting more and the Lower Mainland was lagging behind! If I try to include more variables (percentage of people who have English as mother tongue or whether the seat was won by one or the other), I find the numbers of the right columns. It doesn't increase the R squared coefficient much (i.e: how much of the variation I can explain with these variables) and I find the same effects for the age or the regions. I do find that Liberals-held ridings are doing better than NDP-held ones. This isn't new and you have to wonder how much the NDP is getting its vote out. Overall, the new regressions increase my confidence in my estimates above. The fact the previous turnout (in 2017) is a strong predictor means my age-turnout based on 2017 is most likely valid as base. After, we do observe the 18-34 and 55+ voting more than the 35-54. The net effect is unclear as the 18-34 are heavily behind PR whole the 55+ are in majority against it. There are more people in the 55+ group though. All in all however, the two might cancel out. Remember that my vote estimates above are valid to the extend that the polls are right. In particular, the polls have to be right regarding the regional numbers as well as the levels of support by age. Additionally, these polls have found a large number of undecided and I'm assuming here that these undecided will either not vote or will break similarly to the decided voters. That'a big assumption and an error here (let's imagine undecided ultimately choosing the status quo) would make my estimates all wrong. If the vote count was ending today, I think I'd bet on a small victory of the NO side. But with a full two weeks to go (note: Elections BC actually announced an extension to December 7th) because of the strike of Canada Post) and looking at the trend, I think proportional representation has a chance. It remains an incredibly close race and trying to predict the result is just a recipe to be ultimately wrong, but I'm okay with this! This is just occupational hazard for me at this point. Can the 18-34 (in the Lower Mainland and on the Island) continue to vote so much and make the difference? Regionally, the large increase in the Lower Mainland is nice but I wish (as a PR supporter) I'd see ridings such as Point Grey or the two Victoria ones (on the island) getting higher turnouts than Quilchena for instance (Wilkinson's riding and the one that voted the most NO in the 2009 STV referendum).